RC rate changes the sensitivity of your sticks. High rates makes your quad rotate more with less stick deflection. High rate will make your quad more responsive but at the same time, twitchier. Small movement on the stick would produce big movement in the quad. Increasing RC rate also makes the quad spins faster, as you can see an increase in deg/sec figure. This allows you to do faster flips and rolls as well, but usually we use “super rate” to control how fast we want our flips and rolls to be, we will talk about super rate shortly. RC Expo is also known as Exponential, or simply Expo. It reduces the sensitivity near the centre of the stick where fine controls are needed (for Roll, Pitch and Yaw), while retaining the maximum rotation speed at the ends of the stick. Expo is a percentage value. At 0% the increase in rotational speed between minimum and maximum stick input is linear, imagine the curve as a “V” shape with no stick input being the center. At 50% stick input, your quad will rotate around the given axis at exactly half of the maximum rotational speed. As you increase Expo, the sensitivity around mid stick is reduced so you have to push the stick further to reach the same 50% of max rotational speed. Imagine that Expo changes the “V” shape to a “U”, the higher the expo percentage, the flatter the “U” is around the middle. Super Rate (aka Super Expo in other firmware) changes your full-stick-deflection rate as well as your centre stick precision. It’s like having the combined effects of RC Rate and RC Expo. By increasing Super Rate, it allows you to have relatively moderate stick sensitivity around mid stick for “normal flying maneuvers”, and yet super fast roll and flip at the stick end points. It gives you more flexibility over tuning and control. It must be adjusted together with RC Rate and RC Expo to achieve the desired curve and stick feel. How to Tune RC Rate, Expo and Super Rate? I always put these numbers in a new quad, then start fine tuning for each axis. With any new quad, I always tune RC Rate first. Just cruise around (no flips or rolls), and make sure the quadcopter respond quickly enough to the sticks when doing turns. Not fine adjustment, but general stick movements. Now you can do some precise flying with very little movement around mid stick. Adjust RC Expo until you find a good balance between precision and responsiveness. Different flight controller software has different ranges and scaling in PID, rates and expo, so the same numbers don’t necessarily give the same results in a different firmware. Pro Tip: Applying Expo on the radio (TX) reduces your stick resolution, therefore ONLY set Expo in the flight controller software whenever possible! As your flying skill improves, and you become more comfortable performing aggressive maneuvers, you will probably increase your rates. As you do, you will also probably want to adjust (increase) the expo to maintain accurate fine control. Having consistent rates on all your quads is actually very important because of muscle memory. Especially for yaw and roll, you can train yourself to control these movements instinctively with consistent rates. When you change rates, it can take you longer to get used to the different feel depends on how experienced a pilot you are. So having consistent rates help you moving from quad to quad without surprises. Lastly, next to RC Rate and Expo, we also have Throttle Mid and Throttle Expo. Throttle Expo changes the shape of the throttle curve, it flattens out the curve around “Throttle Mid” and allows for softer throttle response and maximum stick resolution around this throttle level. Throttle Mid changes where in the throttle curve you want to apply the Throttle Expo. By default it’s set to 50% throttle (0.50), but in my opinion this should be set to your normal cruising throttle. This is where you will need the most throttle resolution and it should make it easier to control your altitude. Throttle Mid won’t do anything if you set Throttle Expo to 0, because your throttle curve will be a straight line regardless what throttle mid is set to. I personally prefer to use a tiny bit of throttle expo (<0.10) to get a better resolution and smoother throttle control. It’s especially useful for proximity flying. 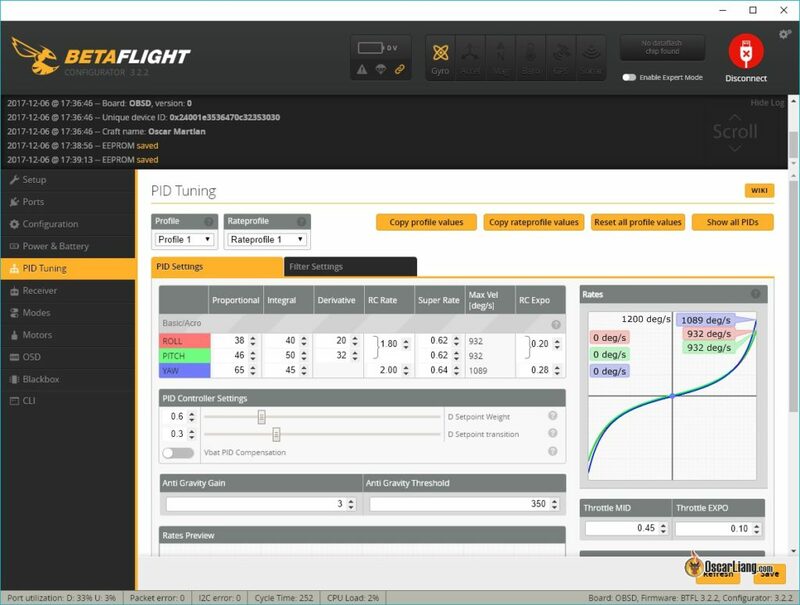 You can also setup throttle curve in your transmitter for more precise throttle control. TPA lowers PID values by a certain percentage, the more you increase throttle, the lower PID becomes. It helps reduce vibration associated with high throttle. TPA breakpoint determines where in the throttle PID should begin to be reduced. You should normally set this slightly below the throttle level where you start to get vibration. See this article for a more detail explanation of TPA. It’s just an estimation, the actual rates of rotation depends on your props and motor, and how good the battery is providing the power. I’m new to this hobby, and i’ve just bought a Taranis qx7, but the throttle stick doesn’t give throttle before its in 50% travel (in the middle).. Do you know how to change that? As he stated in the article, you should NOT use any rates or expo settings on your TX, let the flight controller read your actual stick inputs and set all expo/rates using the configurator. TX expo settings were necessary when using servos and control surfaces as with a fixed wing or heli – but are not needed with the use of a FC that allows you to program them internally. The FC’s gyros are able to detect the rate at which the model is rolling or flipping in degrees per second and uses the rate/expo settings to provide a consistent roll rate. Besides, it would be difficult to set a desired rate if both the FC and TX were performing expo calculations. Ideally you would have rate/expo numbers that you are comfortable with and you’d be able to punch in those numbers on any new build as a starting point. That way, you would have a set rotational rate and you would be used to flipping 360 degrees in x time, allowing you to “feel” when a roll or flip is complete and not have to use visual confirmation. Now it’s march of 2017 and some things seem to be different. Like when you write “I personally use no expo or just a little expo (<10)", the throttle expo now goes from 0 to 1, so <10 would be <0.1 today, right? Also when you write about throttle mid, "You need to use this with some throttle expo, otherwise it won’t do anything." is this statement still true today? So if I want to make use of throttle mid, I have to set expo to something like 0.05? Thanks! But I will try when I have time! thank you for the comment! You cover the broad strokes which is the important part. People can get educated on the specifics with tutorials. Your site is my favourite for technical FPV knowledge. Particularly your articles on noise filtering. Hey man, I’ve recently taken an interest in flying quadcopters, I got a JJRC1000A to start off with and just learning how to get the damn thing to hover was a nightmare, it took me several weeks of playing around with it before I could fly it around my livingroom comfortably without constantly banging off walls and doors!! Then I went out and bought the Syma X5C which I find a whole lot easier to fly, I’m able to cruise around outdoors with the Syma no problem at all. But now I wanted to move onto something a bit bigger and better, also my dad has the Phantom 4 Pro which I’ve had the chance to fly it several times and it was an amazing experience, however, one thing that has me scratching my head with the Phantom, I thought with these high end drones like the DJI ones that the right stick that controls the left and right roll would always remain left and right regardless of the drones orientation, so you could just look at your display that’s connected to your controller and you’d be using that to know the drones orientation, I always thought this was how it’d be for flying FPV, or am I completely missing something? I’ve searched all over the net to try and find an answer to this but I can’t seem to find anything at all, so I am hoping you could enlighten me here. I mean surely people who fly in FPV through buildings around trees etc aren’t having to be thinking when and where those controls will be reversed, I figured you could use the display on the P4 controller for FPV instead of goggles?? Hope you get back to me, thanks in advance. It’s called headless mode. where no matter the orientation of the drone it will always move back if you move the stick in that direction. It is a setting. Hey thanks for the help, i have a question though. i changed my rates. but i cant figure out how to get my “roll” to move only the quad right or left without adding in pitch. Right now as it stands my roll and pitch move simultaneously causing a front ward tilt when trying to “roll right”. is there a way to tune the quad so roll and pitch dont work together at the same time? Yes im using the open source cx20 and i have an issue with the battery getting drained real quick like few seconds on giving it throttle. Just need to know what i can do to make it quit draining the battery and its fully charged. Great article! Thanks for the help! I can fly helis so am kind of surprised I’m struggling a little- but my 250 quad seems more reactive/skittish than my Trex250 heli! Only way i can see is to have separate profile for different modes… but really you should get used to rate mode and completely forget about self-level mode :) All top pilots only fly rate mode. Nice compilation of tuning tips yet again! You have helped me countless times in the past, but in this case your post was detrimental. are you commenting on the right post? I don’t think I talked about mixer in this article? I am assuming you are referring to the “custom motor mixer” post… that was written back in early 2015… cleanflight decided to keep changing things around (including the name of the function), being a part time blogger, i tried my best to amend it and keep it up to day… but there are times I just can’t keep up with things… so if there was any confusion caused I apologise. I dont speak well english and i am new with cf and naze32. Your explanation of these are very easy to understand than cf docs. New to quads. Just built 280 with scorpion motors, BL Heli 20 amp esc, Naze 32 ver6, dx8 tx, Orange 615x using ppm and Clean Flight set up. On throttle up the quad noses over. I rechecked setup and same results. In motors tab in cleanflight the motors do not come up even when using transmitter but come up even with master motor tab. Where do I start looking for problem. Start with the simple things. Have you done a throttle calibration? Are your certain that throttle mid has an effect if the expo is off? Congratulations for the excellent tutorials and articles técnicos.Qual would be quieter fee for “exponential” more suitable for one who never flew and will learn for the first time. Exactly what I needed to read to fix my flight problems from last weekend. Thanks. I was playing with the Y/P/R rate lately. I was looking for the meaning of the numbers and still was not able to figure it out. In the CF forum, i found repeatedly, that the Y/P/R rate is multiplier. Well, i doubt that, because the default value is 0, as far as i can remember. Do you know, how these rates are processed in the PIDs? Hi Ondrej, like i mentioned in the post, it depends on PID controllers, these rates don’t necessary affect PID. I always tought it’s recommended to set Expo in the Tx and not the FC? Most pro pilots don’t seem to touch the Expo settings in Cleanflight at all. that’s a good theory and sounds legit to me :) thanks for sharing!